I have been known to meet the mailman at our mailbox when I'm expecting a package. He knows this and now teases me every time I get one now. I was really hoping for today's Friends with Flair that I would have gotten my new stamps from the sale. Living in the middle of nowhere nixed that idea. Grrrr. I really hope my package comes today. I've never seen that OA paper. I MUST investigate! I am a huge OA fan and you did a great job with this card!!! Very cute card! I hope your stamps come today! Awww...hope your new stamps come today too! Waiting is the WORST part!!! Cute card anyway though! Very nice card! Love the papers you used!! Fun! Very cute! 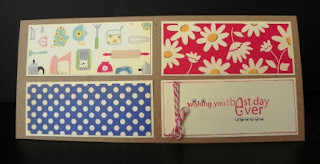 I always love cards using blocks of dp and yours is so nice and cheery! Love this! I agree with you about packages - I love happy mail!